Guess what? Biore brought us surprises at the start of 2013! 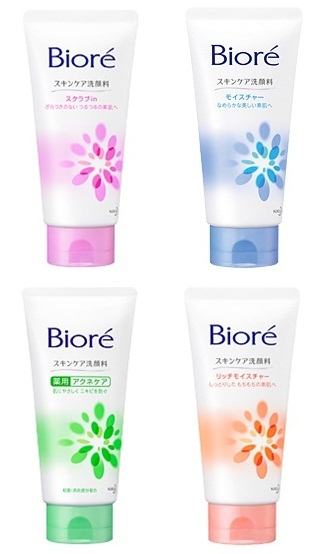 Biore had launched their new series of Facial Foams on 3 Jan 2013! Skin Caring Cleanser Series! Cleanses & Improves. 1 minute is all you need. My skin tends to be oily at T-Zone and dry on cheeks so Normal to Combination Skin Facial Foam is the most suitable cleanser for me. Slowly rub against your skin until the foam appeared then wash it off with water. Very gentle to our skin, after washing off I can feel a little tightness on our skin.. Feeling refreshed and the bounciness on my cheeks! After cleansing your face, next up Scrub! What’s so special about the new Biore Facial Foam Scrub? It’s suitable for all skin types and it is gentle enough for DAILY usage!! Accumulated oil, impurities and dead skin celss can clog pores and make your skin look rough, dull and lifeless. Reveal healthy, glowing skin with this cleansing scrub! Bits in the scrub are really tiny, almost couldn’t feel any bits at all while you scrub. Super gentle to our skin! Can you see the difference after I used Biore Facial Foam & Scrub? Much more fairer and glowing!! – Non residue, Non irritating, Vitalize Skin! The 1st Cleanser that supports & boost skin’s natural ability to self renew! Biore New Facial Foam Series launched on 3rd Jan 2013 and available in stores now! Do grab yourself a bottle now!